Thank you all so much for your comments, emails and support over 2010. It has been a great year. I have enjoyed writing this blog so much and have learnt so much and met so many wonderful people in the process. I am taking a break and hope to be back in 2011. Have a happy and safe Christmas and a wonderful summer. Do you trust your beautician? Against my better judgment, I do, from the eyelash tint I never knew I needed to the hair product I never knew I wanted, which inevitably joins its cohorts stuffed up the back of the cupboard, unused. Arguably however this trust comes from the fact I walk out of the salon with change from $30 no matter how many treatments and products I have had. I am glad that my dear friend Ms C trusts her beautician too, as that particular lady's recommendation led us to Nick's Grill. 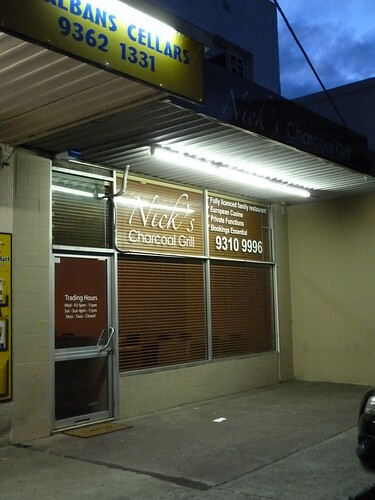 Kenny recently pointed out that "little shop strips that look a bit run down are gems", and by this logic, Nick's certainly is a diamond in the rough, tucked away in a strip in outer St Albans. The family who run this little Macedonian hideaway have been much-loved caterers to the Macedonian community for years, and son Nick has become the earnest, genuine and friendly maitre d' for their new venture. Nick's specialises in grilled meats and from our table, we could watch dad firing up the grill in an open kitchen. They have been open for around three months. ﻿This salad came highly recommended, and with good reason. 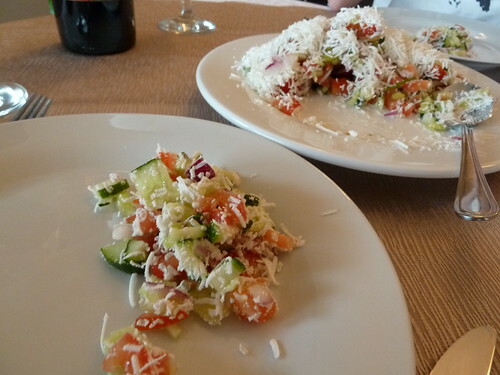 It was similar to a Greek salad in its ingredients - fresh tomato, cucumber, a little red onion and sheep's or goat's milk cheese. However, here the vegetables were chopped into small pieces rather than the large chunks one associates with Greek salad and the cheese was grated on top, a la Parmesan on pasta. It was so delicious - I could have eaten this alone with bread quite happily. The vegetables were super fresh and the dressing light, lemony and tangy. This soup is a soon-to-be menu item and we were lucky enough to be offered a taste. It was simply divine - a thick, rich broth with carrot, potato and fat flakes of pink rainbow trout. I have never had good luck with fish soups or curries as the fish needs a very careful hand or it disintegrates or goes mushy and grainy. The fish flavour in this was superb, present but not at all overpowering. The broth was thick, rich and unctuous, as fine as the best lobster bisque. 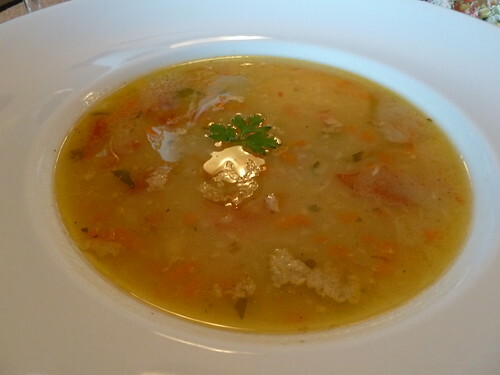 It is Nick's dad's special recipe, perfected through years of cooking in Germany. I can't speak highly enough of this wonderful soup. With a swish of its Macednonian petticoats, it has nudged pho off its pedestal as my favourite soup of all time. Big call but justified!!! 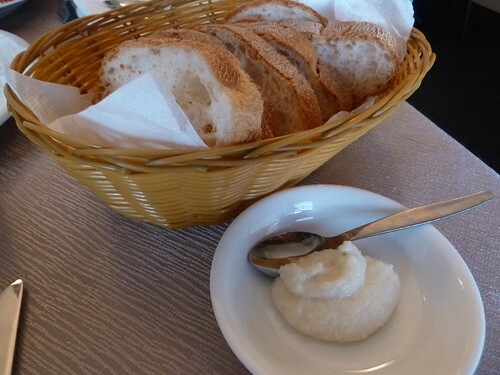 Pleasantly coarse, crunchy Continental bread was per﻿fect for wiping up every last drop of soup and salad. The dip is makalo which is a hot garlic paste similar to Lebanese toum. It was brash and almost acrid, great to spread on the bread and then dip in the soup. First dates, beware! Time for the main event. Most of Nick's meat platters are $17 or so and come with your choice of meat, be it cevapi or skinless sausages, raznjici or skewers, various cutlets and patties. They all come with chips and vegies. We went for the mixed grill for a bit of everything. The cevaps and the very similar pork pljeskavica or hamburger were great, with a pleasantly springy and even spongey consistency similar to Vietnamese 'kebab' or 'roast pork', the sausage-like, skewered tubes or balls sold at Ba Le and Nhu Lan (I don't know the Vietnamese for them - please enlighten me if you do!). A simple piece of grilled chicken breast was perfectly cooked and delicious. The meats went perfectly with the makalo, served here thinned with oil and I think broth, its garlic flavour tempered somewhat. We were so full by this stage and got defeated fast, though, only managing a bite or two of the other meats before surrendering. I am actually not that big of a carnivore and would have liked less chips and more of the wonderful grilled capsicum. The chips were somewhat unremarkable. 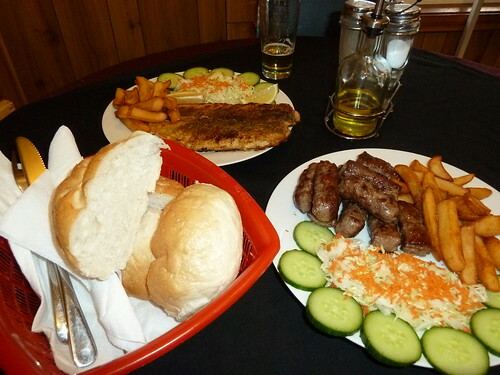 The Croatian Club in Footscray has a very similar mixed grill of just cevapi and raznjici, but their vegies (capsicum, onion and mushroom) are abundant and heavenly, plus their chips are crispier and have a special spice mix on them (I acknowledge Croatian and Macedonian are different cuisines, of course!) Next time I will choose a single platter of just one meat and share that, and hope that there will be more room for more vegies. The standout dish was still the rainbow trout soup, coming soon to the menu and in my opinion, it can't come soon enough. They were so kind to give us such a generous sample (and they hadn't busted me taking photos, at least not at that stage!) Just like in the beauty shop, we got more than we came for, but unlike yet another bottle of hair product, this soup is definitely something I now cannot live without. 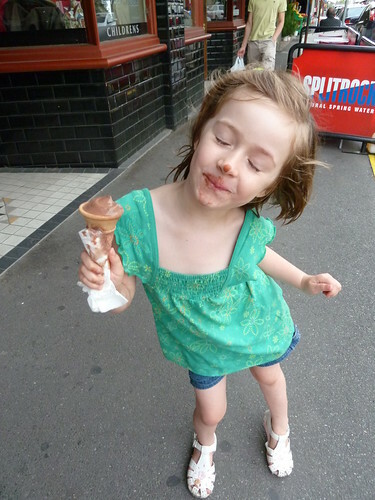 Icecream in summer is one of my fondest memories of my childhood in Melbourne. We never had it at home; it was an "outing only" affair. 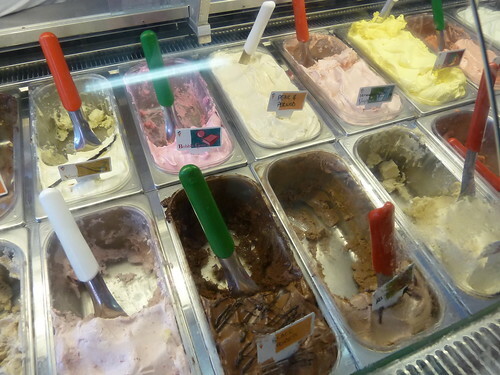 The discussion of what flavour to get was a matter of national significance. 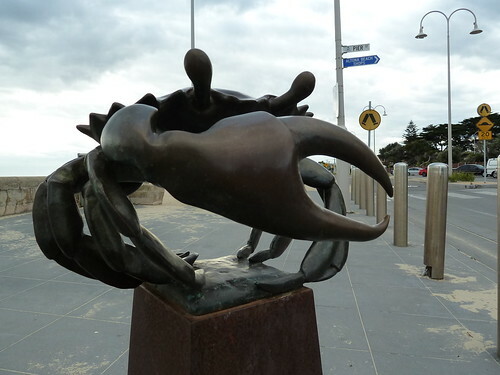 I remember Charmaine's first opening on Brunswick Street and later at Southbank and totally revolutionising ice cream. They had crazy flavours like licorice and chilli chocolate whereas all prior icecream had been hokey pokey, old English toffee and bubblegum. Footscray and surrounds has been somewhat devoid of a good icecream parlour. 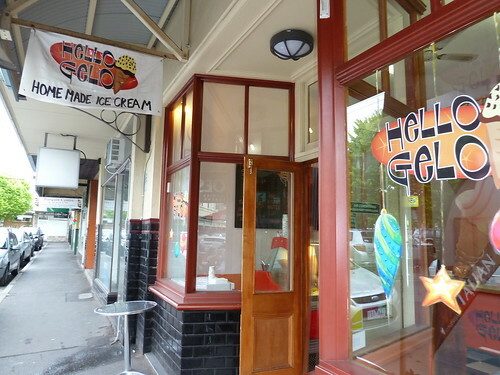 Charlie's did open a gelati bar on Droop Street but to me, half the pleasure of an icecream in summer is lolling about outside the shop or walking along a pleasant promenade, which is hard to do on a busy strip like the Droop St/Ballarat St corner. Hello Gelo is a recent addition to Yarraville village which is supremely wonderful for lounging about, particularly on a warm summer night. The icecream here is handmade, very creamy and ranges from the classics to curiosities such as chestnut (made with real chestnut puree and marron glace pieces) and pear & Pernod. A kids' cone, which is ample even for an adult, is a mere $2.50 or $3 for two flavours. Take-home packs may be made up, too. Thanks Kenny for the tip! There are many great things about being married to an American. Apart from the fact my husband is just generally awesome, the benefits that spring to mind are home-made, lovingly crafted barbecue sauce and elotes, BBQ'd corn cobs slathered in mayonnaise, Parmesan cheese and chilli powder. But there are some eye-rollingly infuriating, very American parts of my partner's personality that I would love to change, namely his tendency to customise the menu within an inch of its life. "Can I have the tomato and avocado on toast, but with the Promite on the side, and can you squeeze a lemon over it? And can you add just one scrambled egg - yes, just one - and a piece of black pudding? And a macchiato with cold milk, not steamed. Thank you." Cue much shrinking-behind-menu-until-level-with-floor on my part. Tan Truc Giang have loads of interesting﻿ dishes which I for one have never seen before. There's a special prawn-and-egg "cake" plus mackerel dishes, both crispily fried and braised. 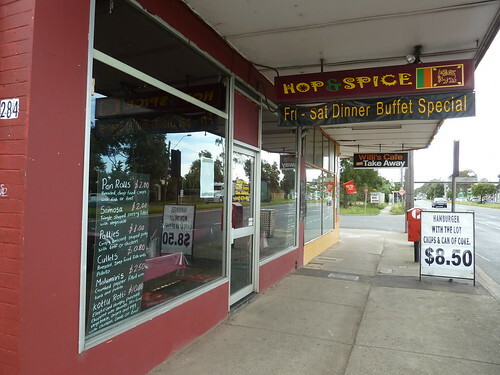 They do a fabulous roast pork roll that you have to know to ask for. They always have southern-style Vietnamese chicken curry which is mild, yellow and coconutty. A friend just mentioned the other day how much she loved this and had only ever had it at people's houses, when it had usually been made by the grandmother. 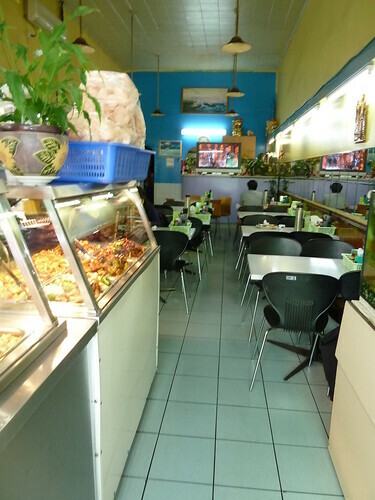 She feels it is very much home cooking, and to me that is the style of cooking here at Tan Truc Giang. This separate unit is 100% vegetarian (and I assume vegan). I have been on the hunt for a Vietnamese wheat gluten dish for a reader, veggiegobbler, and here it is, or something like it, I hope! The dish at the bottom right is wheat gluten with chilli and lemongrass, so I settled down for a plate of that with a few of the other mixed stirfries. Yum yum! The wheat gluten, which I know as seitan, was really good. It is eerily similar to meat, tasting (and looking) like well-cooked shredded chicken. Seitan is made by making a dough out of water and flour and then washing it until only the strands of gluten remain. I remember doing this in Home Ec at school but I cannot recall why or what we did with it - certainly not make seitan, given that most of our Home Ec offerings were anachronisms like roulades or things stuffed in crepe baskets. Anyway, the rest of the stirfries were tasty mixtures of soft, juicy tofu and mushrooms and crunchy vegetables. They use interesting gourd-like Asian vegetables here of which I don't know the name, but they are similar to zucchini or cucumber. It came with a tangle of sweet, lightly vinegared carrots and bean sprouts. A great, healthy lunch. Veggiegobler, I know it's not with cashews or satay as you remembered, but I reckon it is pretty yummy! 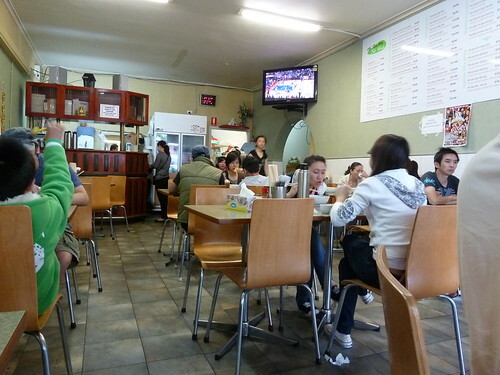 Another reader, Matt, highly recommended the goi cuon chay or vegetarian rice paper rolls. These are made daily and stacked in containers on the counter. 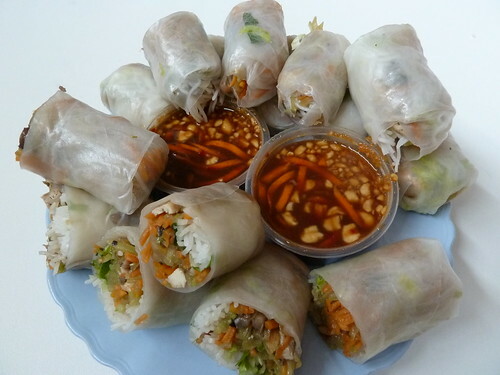 Wow - great call, Matt - they really are the best rice paper rolls I have ever had! The skins are so tender and soft and the fillings super fresh. Inside are rice vermicelli noodles, marinated tofu, mushroom, pickled carrot, lettuce and other good things. I like that they are not wrapped within an inch of their life - the wrapper is still delicate, soft and pliable. The dipping sauce is made up fresh with each purchase and is delicious, hoi sin-based, sprinkled with chopped peanuts, chilli and carrot. Eat them soon after purchase and if you can, purchase them early in the day soon after having been made as the skins become hard and unappealing fast. The man in particular who runs Tan Truc Giang is really lovely. 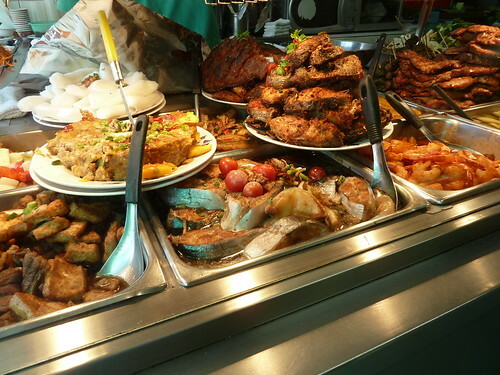 They keep their bain marie spick and span, constantly refilling the trays and plates and ensuring no drips smear the sparkling silver between the various dishes. 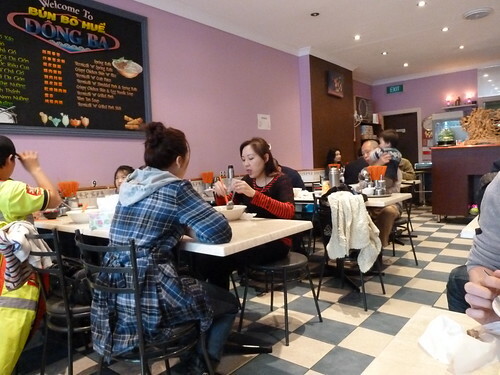 The counter is often a few people deep and with Footscray shoppers of all ethnicities. Everyone is welcome - even finicky Americans. PS: From a reader: "This is the best Vietnamese place in west. Pork roll is absolutely delicious plus try their diced beef with fried rice (yummmm). 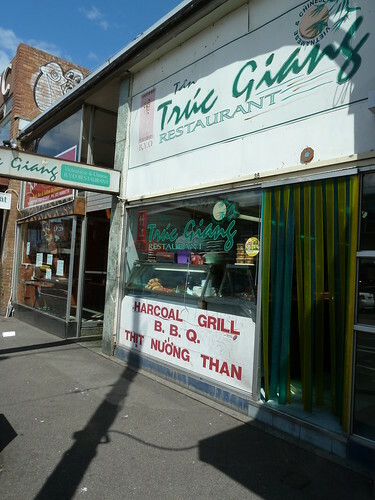 I live in North Carlton but visit Truc Giang at least once a month." 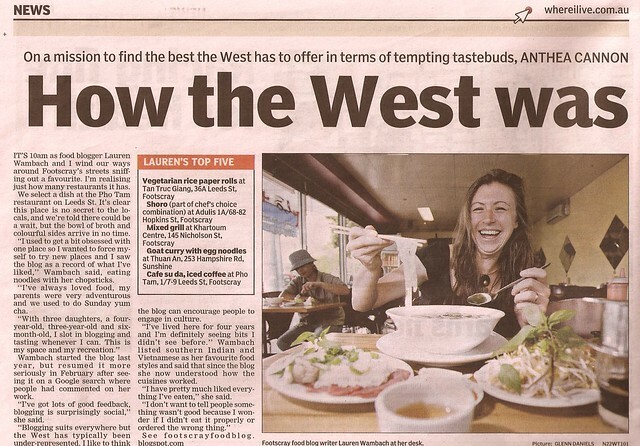 "How the West was won in taste"
For easier reading, here is the online link. Thank you Pho Tam for kitting out my desk with your amazing pho! For more wonderful pho all around Australia, check out my friend and SBS Featured Foodie Thang @ Noodlies' guide to the best pho around. If you would like some more Sunday morning reading, The Age recently published a thought-provoking article on food blogging. Have a wonderful day and as always, thank you very much for reading! "Are you sure this is such a good idea?" said my friend as we rounded the corner. 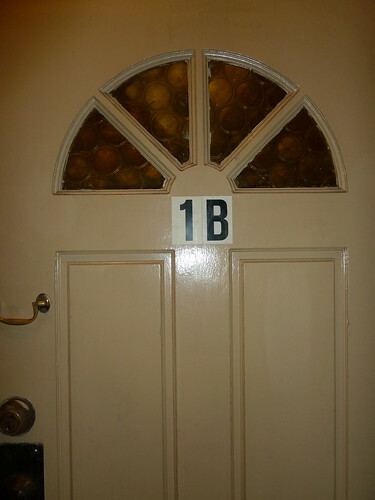 At the top of the stairs, though, the hearty albeit pleasantly surprised welcome from the owner made us feel instantly at home. 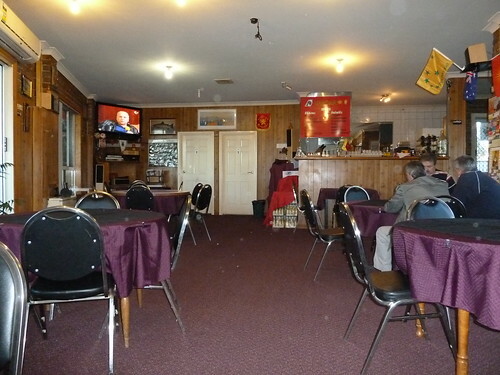 Vardar Grill is on the first floor of a quiet shopping strip in St Albans and is an extended "Dad's pool room", decked out in fishing trophies, pennants, flags and scenes of the old country. It's a welcome refuge for the western suburbs' Macedonian community but also warmly welcomes seekers of grilled meats and quiet conversation. 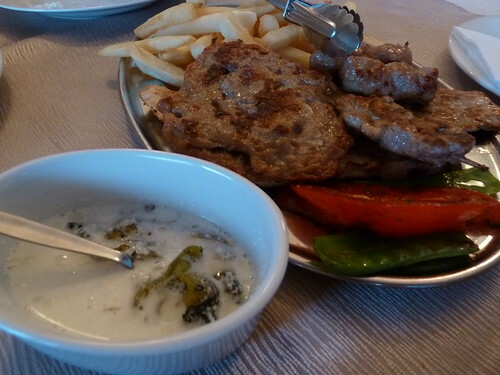 I know very little about Macedonian food. I had a Macedonian housemate once but his only acknowledgement of the food of his homeland were his mad scientist-like yoghurt experiments, which left the stovetop a perpetual shade of burnt and bubbled brown and the house infused with the alternating smells of boiled or off milk. He was never successful. Perhaps unsurprisingly, all he would say of Macedonian cooking was that it was "hard". Here at Vardar, there is a small menu in Macedonian (its English transliteration, at least) above the bar. 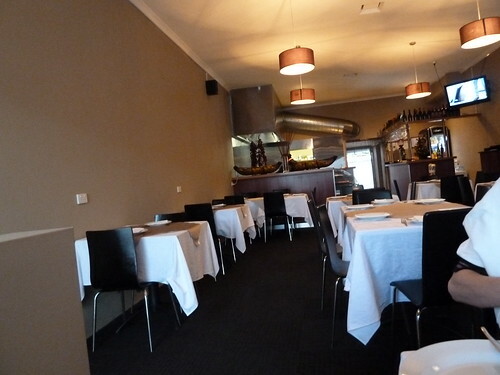 Vardar specialises in grilled meats and we happily deferred to the owner's suggestions. The fish was perfectly cooked, dusted in flour and fried quickly. We also sampled cevap or skinless sausages which were super-meaty, juicy and rich. An accompanying salad of vinegared coleslaw and just-sliced cucumber was excellent. We sipped our beers and then an impeccable short black. As the world outside darkened slowly, one of the guys on the balcony fetched a huge accordion-like instrument and with his friends, began to sing. Outside the Sydenham line rushed past and the gum trees came into relief against the summer night sky. The Macedonian presence in the west is perhaps not immediately apparent, but like a folk song carried on a Balkan breeze, if you care to listen you will be richly rewarded. One of the things I love most about Footscray is that rather than a single main drag like Victoria St, Richmond, its pseudo-circular layout gives it the feeling of a little village, full of nooks and crannies to explore. A shopping trip is not just a plod up and back like a train journey, stopping all stations. I love to wind my way up and down streets, tiptoeing through arcades, popping in and out of markets at different entrances that open in a splash of noise and life to totally different vistas every time. 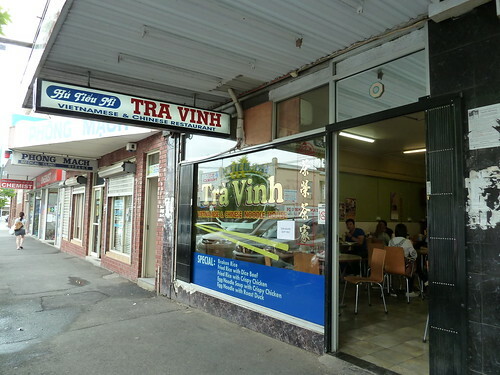 Tucked up Nicholson Street near the Little Saigon Market is a little treasure, Tra Vinh. 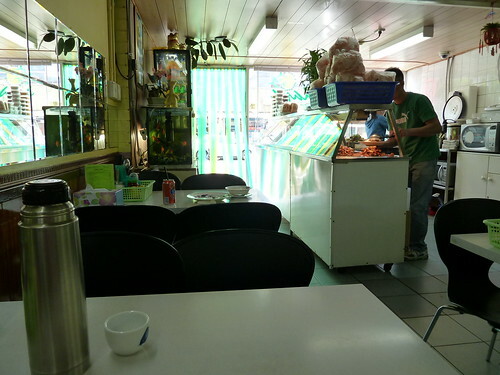 It's a hu tieu mi shop which means it specialises in hu tieu (rice noodle) or mi (egg noodle) dishes that come either in soup (nuoc) or 'dry' (kho), with a small bowl of soup on the side. 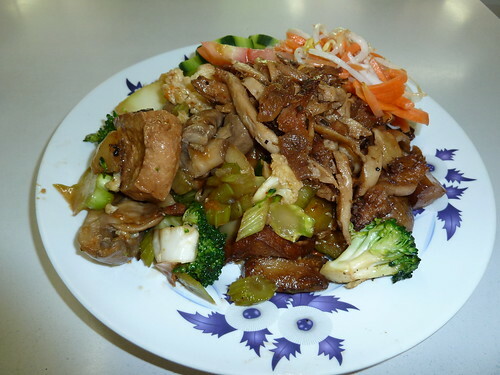 They also have a range of bun dishes which are warm rice vermicelli salads, as well as com or rice dishes such as the much-beloved pork chop and egg on rice. This is a mix of rice and egg noodles﻿, vegies such as bean sprouts and carrot and a lucky dip of goodies including a prawn, a piece of calamari, some liver, shredded pork, quail egg and a piece of fish cake. The accompanying broth was real chicken stock with tasty pork mince on the bottom. The noodles were fantastic - I love the contrast of the two types, the rice translucent and delicate, the egg squigglier and "meatier" with a toothy, bouncy texure. They were salty and slightly sweet, tasting like they had been tossed with a dark soy/caramel sauce perhaps? I had had this dish before at Phu Vinh and bagged it for the use of sweet chilli, assuming this was a cheat's version of nuoc mam cham or seasoned fish sauce. Reader Hung set me straight (as I so appreciate him and others doing, as everything I know, which is not all that much, is from friends, books and trial & error - I have never been to Vietnam) and said that sweet chilli sauce is really what makes this style of hu tieu mi. Even though I am not a mad fan of sweet chilli, I followed Hung's instructions of adding a little of the broth to moisten the dish and mixing it all through. It was so delicious, although I do think Tra Vinh had a better balance than Phu Vinh as the sweet chilli was not nearly as overpowering. Bun or rice vermicelli salads are a great starting point if you are unfamiliar with this branch of Vietnamese food. Billy's salad above had the aforementioned rice vermicelli, lots of vegies like lettuce, cucumber and carrot, and was topped with the dac biet or "special" mix of spring rolls, grilled pork or thit nuong and bi or shredded pork skin. You get a bowl of seasoned fish sauce to tip over as a dressing. The spring rolls here were excellent - at some places they can be nothing more than a crunch-fest with negligible filling, but here you could really taste the well-made filling of pork, mung bean and black fungus. Yum!! Vegetarians, I'm not sure if they do it here, but at other places try asking for bun cha gio chay (vegie spring roll rice vermicelli salad), although check that the accompanying dressing is vegetarian. I cannot get enough of the jasmine tea that is complimentary at every Vietnamese restaurant in a thermos on the table. It is my number one hangover cure, preferably imbibed with copious amounts of yum cha. 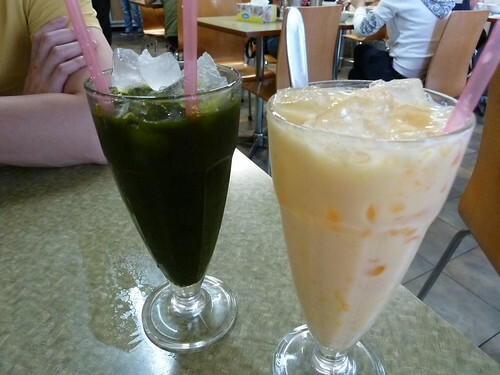 Today we tried some Vietnamese cold drinks. You HAVE to try the orange egg soda or sua hot ga﻿. It's a home-made soft drink made with orange juice, condensed milk and egg and tastes like a rich orange and mango milkshake - kids would go mad for it. My pennywort drink was equally delicious, sweet with a very refreshing, almost grassy flavour. Pennywort is apparently much prized in traditional medicine as an anti-anxiety agent, stamina-builder and is even thought to lower blood pressure. In any case, after a crazy week, a great lunch with a lovely friend will do all of that anyway. 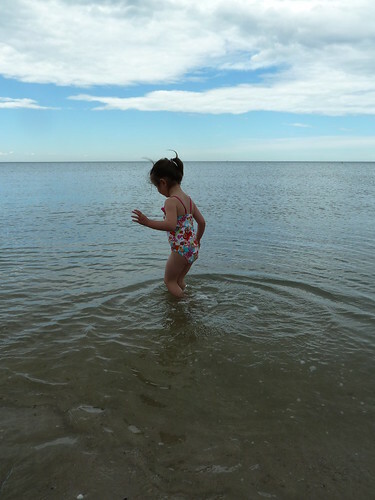 Ah, don't you just love the beach! Actually, I don't really. My skin was made for gathering kelp in the drizzle along a stony Irish coastline, not roasting under the hot Antipodean summer sun, hat jammed on head and sticky with 30+ sunscreen. Pah, give me a misty peat bog anyday. But what I do love is the excuse to eat fish and chips. 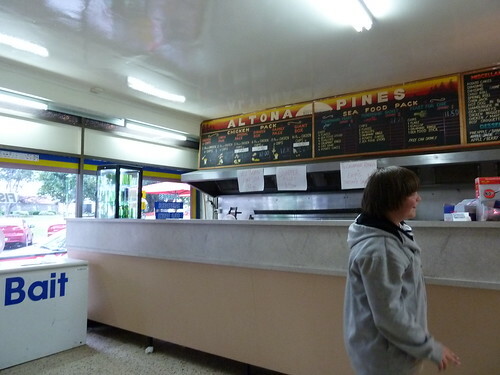 Altona Pines Take Away is your last stop before the lifeguard station and the beach beyond. It sits opposite a lovely park under the shade of the enormous pine trees. Love the old school sign! The menu isn't going to win any prizes for originality but I like that. They have a few different types of fish, from flake to blue grenadier to snapper. I am biased towards places that still do the butcher's paper wrapping - it just feels right. Eating fish and chips out of a box is like drinking champagne out of a tumbler. I love the glorious tumble when you open the last layer of paper a la pass-the-parcel and everyone dives for their deep-fried goodies. People tend to have their "thing", be it fish and two potato cakes, fish and three calamari rings and/or a couple of fried dimmies in their paper bag with dark soy sauce. Chips go without saying! 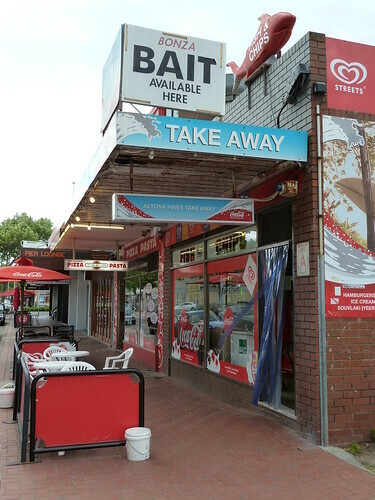 The fish and chips here are really good with fish that's always fresh with crispy, ruffled batter and plenty of crunchy chips to squabble over like seagulls. 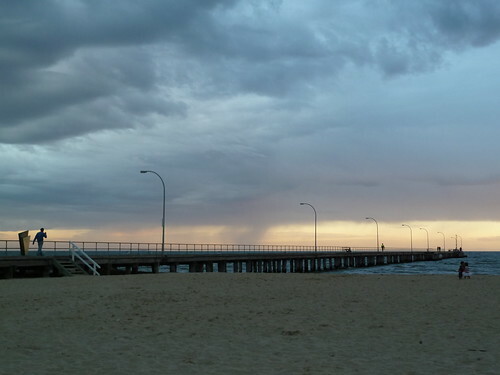 If the beach is too windy the park is a lovely place to sit, protected from the elements with a fence and trees. There is great play equipment for the kids and on summer weekends they will have daggy but fun things like the police band. Really, I don't need an excuse to eat fish and chips. The beach at sunset is a bonus. 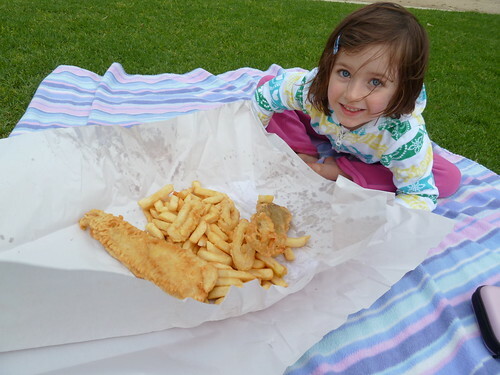 I wonder if Altona Pines is Julia's favourite fish and chipper? Door: High lip/low step to enter. Layout: Room to manoeuvre but high counter. No eat-in. I must have walked past Dong Ba too many times to count on my way to or from somewhere else, and there was the problem. Either the more you pass by somewhere, the more it becomes an itch you just have to scratch, or conversely, the less you notice it until it merely becomes part of the landscape. someone, they want me to pick the place. 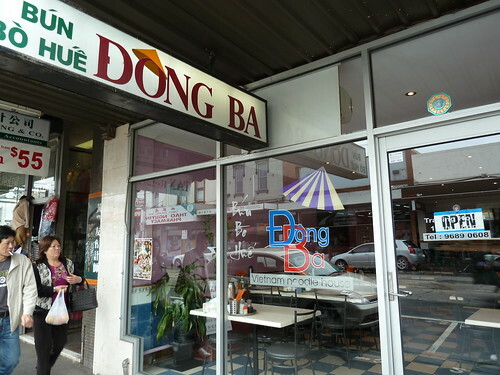 It was lovely that day to meet up with another intrepid foodie, Billy of Half-Eaten, and I happily deferred to his suggestion that we try Dong Ba. 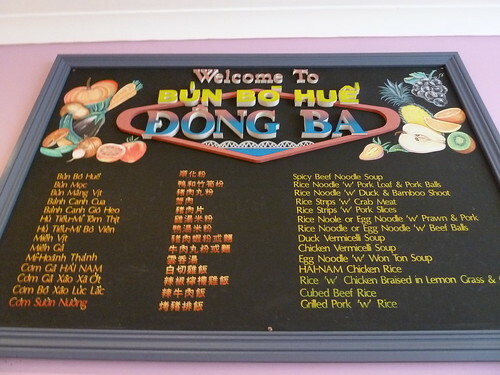 The menu is a simple, purely Vietnamese affair (they have paper menus, not just this board). 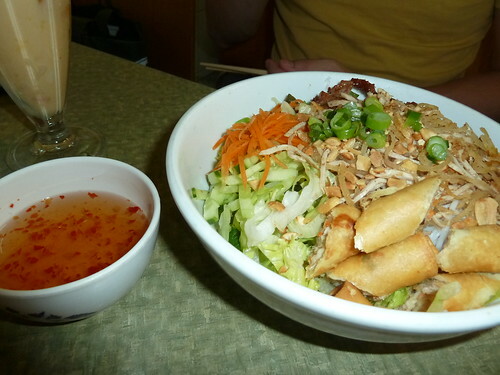 There are various bun rice vermicelli noodle salads, com or rice dishes, plus a whole range of Vietnamese soups. For a long time I thought pho was the be-all and end-all of the Vietnamese soupery arsenal, but far from it. From the dark, chilli-slicked depths of bun bo hue to the crystalline clarity of hu tieu mi, from the pong of bun mam to the benign, translucent cassava noodles of mien ga - when you're tired of Vietnamese soups, you're tired of life. 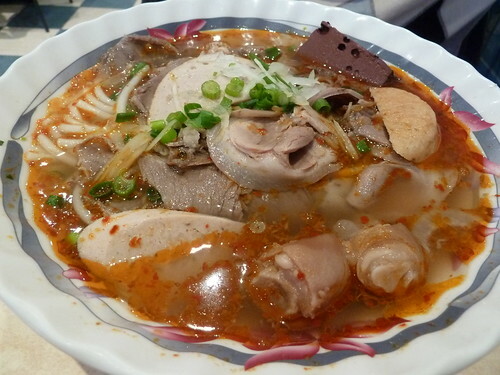 Dong Ba's specialty is the bun bo hue, usually translated as "spicy beef noodle soup", and this was Billy's choice. It's a traditional dish from Central Vietnam. Check out the absolutely amazing array of offal! This soup truly was a thing of beauty. 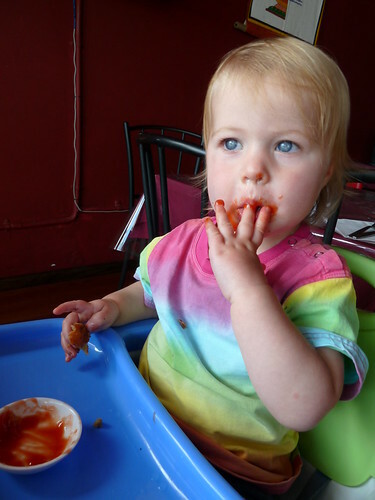 Pork blood, pork knuckles, braised beef, various sausages and loafs, even what Billy was sure was tongue. I may be too gutless to eat offal but you could not help but be impressed. I tried a little of the broth and Billy is absolutely right when he says that bun bo hue is actually meant to be a lemongrass beef soup rather than just a chilli beef soup. The flavour of the lemongrass in this particular broth was just remarkable, so bright and fresh. 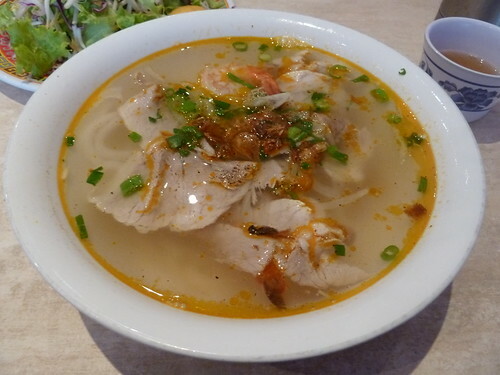 I went with something I had not tried before - the banh canh tom thit or prawn and pork "soup noodle". The unique feature about this soup is the use of a particular noodle which very much resembles Japanese udon. 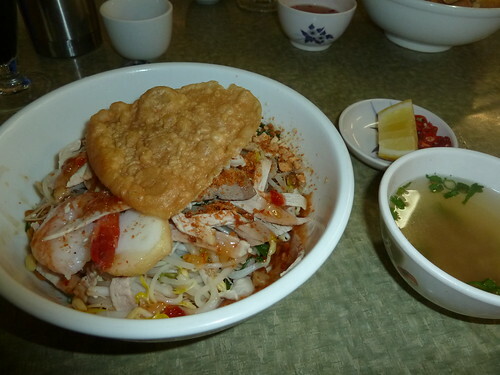 It differs in that udon is made from wheat whereas banh canh is made from rice or tapioca flour. The noodles are thick, white and cylindrical, tender yet pleasantly toothsome. I absolutely loved them - in fact I think I prefer them to flat, white, pho-style noodles. They appear on menus in translation as "drop noodles" or "rice starch noodles". They have more bite, more "spring" - altogether more character. My stock was delicious, very fresh and clear. We had a big plate of mixed lettuce, herbs, bean sprouts and a little cabbage and carrots to toss into the soup. Billy explained that in Vietnam there would be more local vegetables such as water spinach, split and curled as described by Wandering Chopsticks. I am getting more used to lettuce in a hot soup. At first I found it odd - warm, wilted and unappealing - but after reading somewhere that it is supposed to sweeten the broth somewhat, I have to concur it does. This is a lovely little restaurant - most things are under $10, it is bright and cheerful, and the small menu is easily navigated from the familiar to the obscure. I can't believe I bypassed it for so long. Sometimes we spend our whole life searching for what has been right under our nose the whole time. 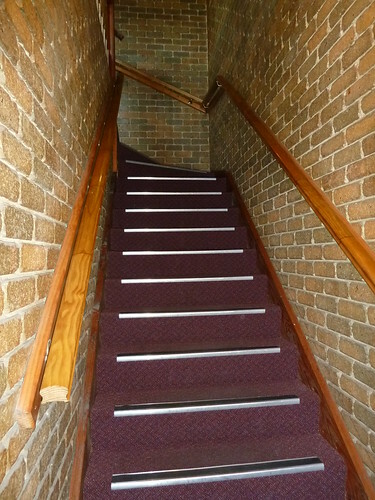 Entry: Small step to enter. City of Melbourne High School muck-up day. Who do we have here? Well, there's Footscray, the edgy cool girl who gets As in every class (without trying) but wears her uniform too short and smokes down at the end of the station. 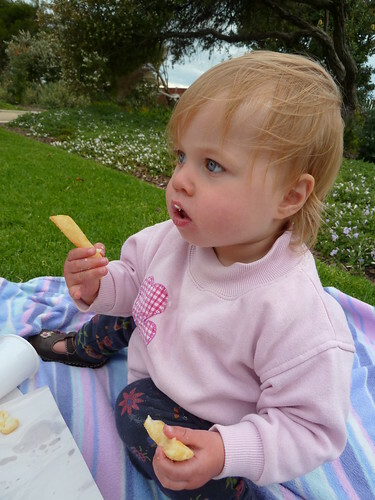 Yarraville had a rough childhood but fools everyone that she was born with a silver spoon in her mouth. 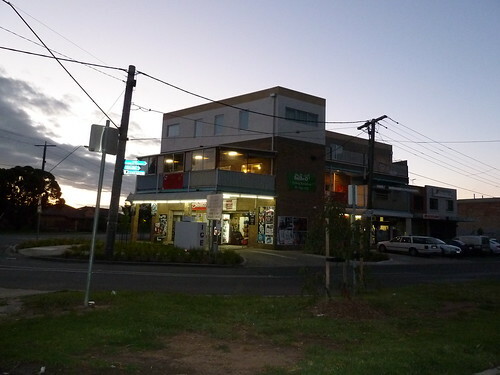 Seddon has it all but is still everyone's best friend. Maribyrnong lives to shop and jog along the river - you may not think she is all that fashionable but she is a good honest sort, always reliable and there for you. Photo time! Hang on, someone's missing. Typical - Braybrook is wagging school again. No great loss, smirk the mean girls, tossing their hair. Her uniform is never on right, it's always unironed and she seems to skulk around on the outer. Still waters run deep, though, and I believe Braybrook will come good. Right now she's lying on her bed in her fibro house, dreaming of the person she will be and all the places she will go one day... maybe even Sri Lanka. Braybrook is often where you drive through to go somewhere else, but if you slow down you will be rewarded. Right near the shell of an abandoned factory and next to an old-school Aussie takeaway, Sri Lankan restaurant Hop & Spice offers refuge from the roar of passing cars on Ballarat Road. 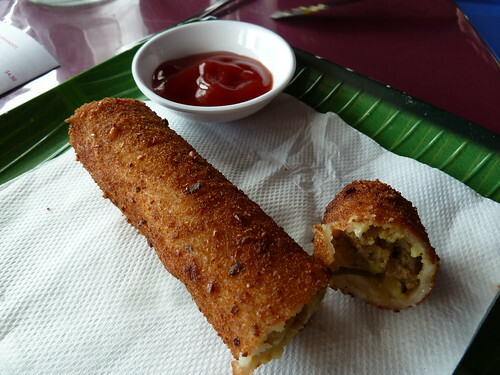 ﻿This is a typical Sri Lankan "short eat" or snack - a spicy minced meat, potato and pea filling (similar to that a samosa filling) tightly rolled up in a coconut pancake, dipped in breadcrumbs and deep-fried. So yummy! It came with a side of good ole dead horse. Pan rolls - if only the tradies going in and out of the takeaway next door knew what they were missing out on! String hoppers are a very cool foodstuff unique to Sri Lanka. They are little "webs" of what looks like rice vermicelli. They are made from rice flour that is extruded by hand through a special press and steamed on individual mats (see here). Bharat Traders sell them ready-made dried in boxes if you want to cook them at home. 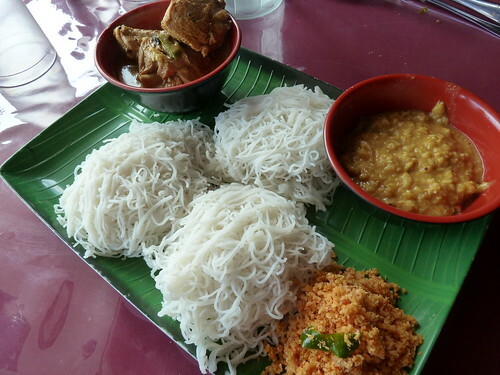 Anyway, they taste different to rice vermicelli and because they are like little mats, you can pick them up and use them to mop up sauces and grab pieces of meat that you couldn't do with regular noodles. My "pack" came with my choice of curry (I chose chicken) as well as dhal (parripu) and pol sombol (coconut chutney). The dhal was absolutely fantastic - creamy and sweet with coconut, fragrant with curry leaves and mustard seeds and with a big chilli kick. The lentils were perfectly cooked, neither hard nor too mushy. The coconut chutney was fabulous - I am sure it was fresh coconut, not dessiccated, mixed with red chilli and lemon. It hit all the right notes - sweet and somewhat cooling yet tangy, rich and spicy all at once. Although tasty, I have to say I found the chicken somewhat dry. Next time I will choose the lamb or the beef and see if either are the Sri Lankan "black" curry style, which is made with spices that are roasted until a very rich, dark brown and ground until they almost resemble coffee. There is a really exciting range of vegetarian dishes like bathala - "sweet potato in thick sauce", stir-fried snake bean in hot chilli and even kaju hodi in which cashews are cooked with coconut and green peas until amazingly plump and creamy. These small roti were flavoured with onion, fresh coconut and a little green chilli﻿ and came with a very sweet onion sambal. I did find these somewhat heavy. 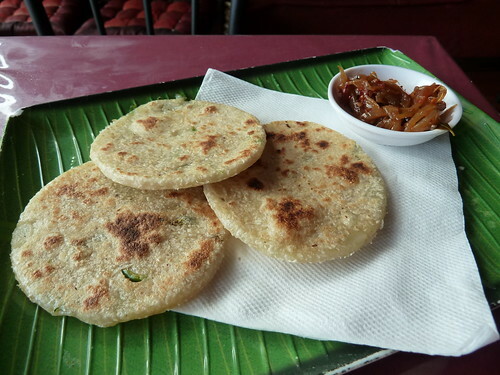 Really I was craving the aapa or "hoppers", bowl-shaped pancakes made of a fermented rice flour and coconut batter, cooked in a special pan and not flipped - dosa or injera's Sri Lankan cousin. These are available only on Friday and Saturday nights when Hop & Spice have their fabulous-sounding buffet. 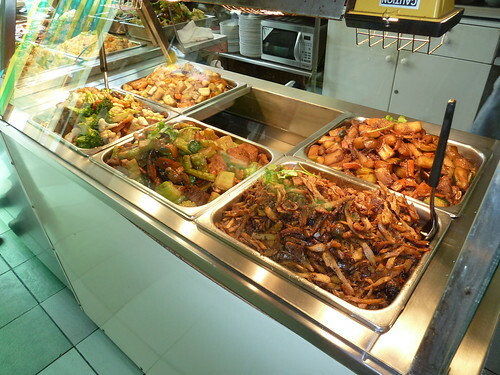 For $20 for adults and $8 for kids, you can have a veritable feast of pan rolls and other "short eats", breads, hoppers and string hoppers as well as curry of all persuasions. Unreal! 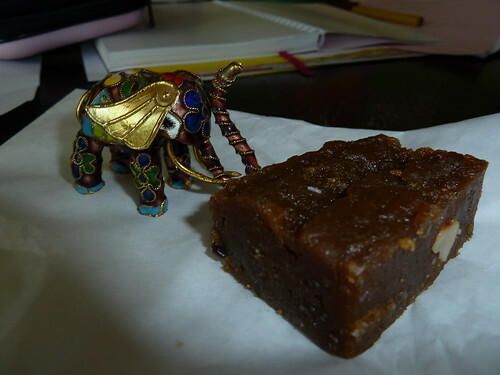 Who can resist subcontinental fudgy sweets? This was a yummy, jelly-like sweetmeat made from jaggery (unrefined cane sugar said to be higher in trace minerals than the white or even the raw supermarket stuff), coconut milk and cashews. 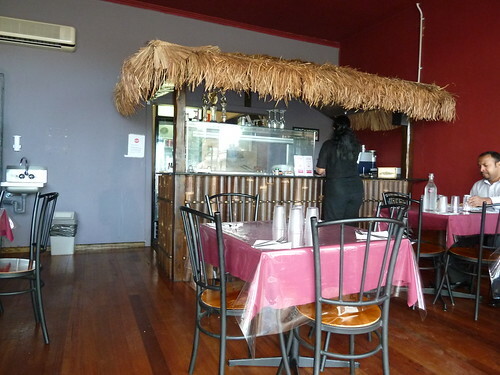 Ah, naptime may be sweet but it is made even sweeter when savouring a little slice of Sri Lanka, and sweeter still to know that it is from this fabulous little restaurant - a Sri Lankan pearl in Braybrook's slow but inexorable awakening.